Spruced Up - Legacy Spruce / Mahogany Guitar World Review - Prestige Guitars Ltd.
Vancouver’s Prestige Guitars have firmly established themselves as one of Canada’s premier electric guitar builders. The company’s superb solidbody and archtop electric guitars with stunning tones have resonated with musicians from the U.S. and abroad. Prestige also crafts exquisite acoustics, which—for no good reason—have been overshadowed by their very popular electric guitars. Now, that’s all about to change with their brand new Legacy Series acoustics. The company’s original Eclipse series acoustics, with grand auditorium bodies and beveled Venetian cutaways, featured high-end adornments like gorgeous abalone purfling and binding, and top-shelf electronics, all meticulously handcrafted for serious acoustic enthusiasts and live performers. Prestige’s new Legacy series are beautifully understated orchestra model acoustics that are definitely vintage inspired. Of the three acoustics in the series—the Legacy Koa/Koa, Legacy Spruce/ Rosewood and Spruce/Mahogany—I took a look at the Legacy Spruce/Mahogany, which immediately caught my eye with its striking tobacco burst finish. For this Legacy model, wood choice is the key ingredient in tone. Here, the winning combination of a solid Sitka spruce top married to a solid Khaya (African) mahogany back and sides provides boomy bass, and a percussive midrange topped off with crisp and articulate high end. The guitar’s thinly applied tobacco burst gloss finish for its top and deep espresso stain on the back and sides doesn’t feel tacky to the touch. And its tortoise shell body binding seamlessly blends into the overall look for a result that’s just plain gorgeous. For a small-bodied acoustic, the Spruce/Mahogany has plenty of volume, which is mostly due to how Prestige flawlessly merges a lower body depth of four inches to an upper body depth of 3.5 inches in order to balance its clarity and bottom end. The one-piece satin finish mahogany neck is a fuller C-shape that almost certainly contributes to the Spruce / Mahogany’s bigger-sounding voice. The guitar also features a 25.4-inch scale length, ebony bridge and fingerboard, herringbone rosette, mother-of-pearl inlays, 20 frets, bone nut and saddle, Gotoh 510 tuners with ebony buttons and a LR Baggs Anthem SL preamp with a mic level control located underneath the sound hole. The first thing that’s apparent from the Spruce/Mahogany is its assertive midrange and volume. Strummed hard, its huge acoustic voice emerges with powerful dynamics that belies its smaller body size. When I dug in on the bass strings, the guitar packed a blooming bottom end but quickly snapped back to articulate chime once I eased up on my attack. 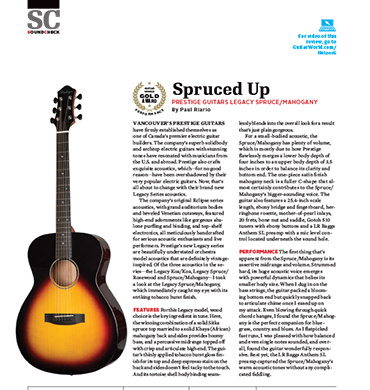 Even blowing through quick chord changes, I found the Spruce/Mahogany is the perfect companion for bluegrass, country and blues. As I flatpicked fast runs, I was pleased with how balanced and even single notes sounded, and overall, found the guitar wonderfully responsive. Best yet, the LR Baggs Anthem SL preamp captured the Spruce/Mahogany’s warm acoustic tones without any complicated fiddling.